The LoreGen Worldbuilder creates procedurally generated worlds, with LoreGen, then lets you explore these worlds. Both LoreGen and the Worldbuilder are currently in version 0.12. 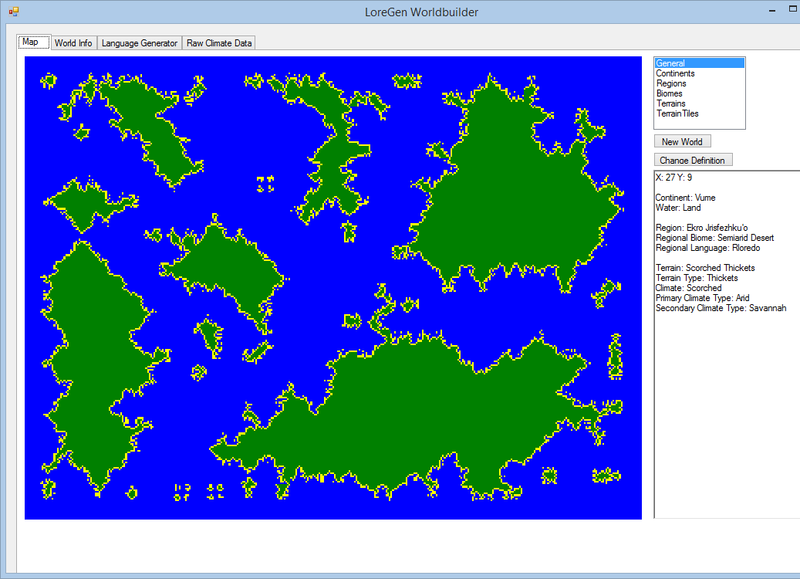 The LoreGen web site is in the process of publishing a complete tutorial of how it generates worlds. View procedurally generated worlds through maps of six different contexts. Double click the map to view continents and regions in detail. Explore the geography, biomes, and terrains of the world. To learn more, please visit the LoreGen web site and join the mailing list. Extract the ZIP and run the executable. Windows only.